promote public art in the form of a permanent sculpture collection in and around Champaign County. and innocence of children at play. was a beautiful addition to West Side Park with its graceful arch welcoming park users from the east. Kicking off a weekend of appreciation for the arts in Downtown Champaign, the Public Art League presents ‘Sculpturefest’ on Friday, August 20th. The event is open to the public and is a celebration of the arrival of sculptures that will be installed downtown. 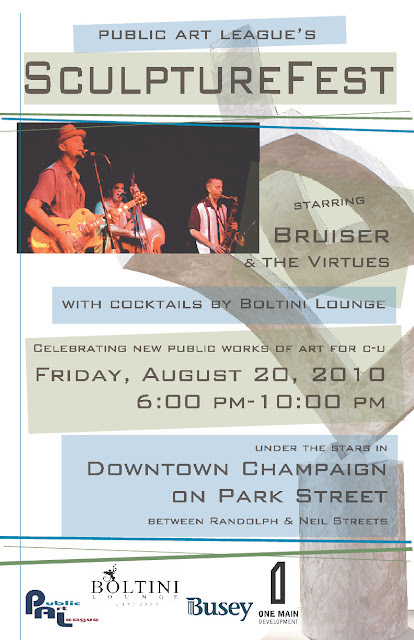 Starting at 6:00 p.m., the party will take place on Park Street between Neil and Randolph Streets and feature live music by Bruiser & the Virtues (starting at 7:00 p.m.) ...and summertime cocktails by Boltini Lounge. Learn more about the Public Art League and the program which is bringing more sculpture and public art to Champaign while you mingle with many of the artists whose work will be on display in our community. Join the party on Friday, August 20th from 6-10 p.m. on Park Street as we kick off a great weekend of support for the arts. Special thanks to Busey Bank and Boltini Lounge! Sponsor: Jos. Kuhn & Co.
Champaign now joins Urbana with a program to place public art in various location in the city. The Champaign City Council's decision last week to join with a private group to cooperate in placing sculptures in various locations around the city is welcome as an example of public-private cooperation to support public art. It's a no-risk proposition for Champaign taxpayers that can enrich the social and cultural life of the city at little or no public cost. The Champaign City Council unanimously approved support for the Public Art League. The Champaign City Council looks to the Public Art League for leadership, as it considers streamlining subcommittees by sidbanding the City Council's Public Arts Comission.. 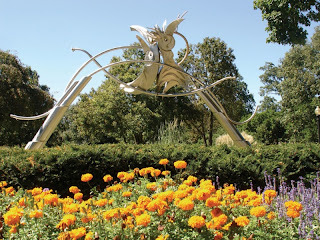 Interested in Seeing More Public Art in Champaign? The Public Art League (PAL) cordially invites you to a reception to learn more and become a member. This new not-for-profit organization, comprised of Champaign-Urbana area residents, is working to make great public art a big part of our community. PAL is sponsoring a competition that will be placing public monuments, sculptures, and other public works of art right here in Champaign on August 20th and we need you. Please come join us and find out how you can help make CU a more creative place to thrive! The Public Art League (PAL) and City of Champaign in Illinois, are seeking artists to participate in the First Annual Sculpture Competition. Sculpture entries will be judged, selected, and then need to be delivered to the unveiling Ceremony August 20, 2010. They will be displayed at the Champaign Park District's Downtown Festival of the Arts August 21, then be available for a two year installation, during which time we will attempt to arrange purchase for the Art as part of a permanent public/private collection in our community. PAL and the City of Champaign reserve the right to determine the locations and number of sculptures that will be mounted into the downtown streetscape and Second Street Sculpture Park for exhibition from August 2010–August 2012. Artwork will be selected to compliment its surroundings and will be displayed to serve as major visual anchor points, community identity and a statement that Creativity and Art are of vital importance to our existence in Central Illinois.